Day one of the Crock Pot Challenge was a success! On Thursday morning at the gym, I spent some time flipping through the latest issue of Cooking Light magazine while I warmed up on the elliptical. When a recipe for chickpea curry popped out at me, I dog-eared the page in the magazine because it seemed like a recipe I could adapt and make crock pot-friendly. I wasn’t sure how the chickpeas would hold up all day in the crock pot, but since I’ve had a positive experience with canned kidney beans and black beans in the crock pot, I figured my chances were pretty darn good! This was also my first time using garam masala, which, according to McCormick, is a sweet and aromatic blend of spices that delivers warm, exotic flavors essential to traditional Indian cooking. I’ve seen a bunch of different recipes use the spice many, many times before and figured it was time to experiment with garam masala since so many people seem to love it! I know I’m late to the garam masala party, but after digging into this dish, I’m so glad I finally gave it a shot. The spice added hints of coriander, pepper, cumin and cinnamon to this dish and I absolutely loved the flavor. 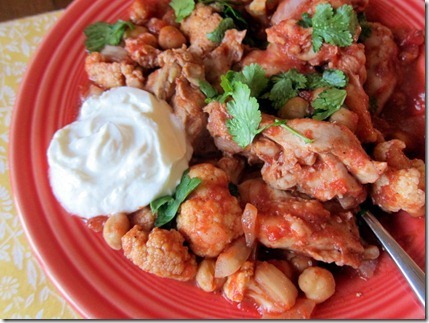 Adding a dollop of plain Greek yogurt at the end gave this dish an extra pop of flavor and creaminess. Ryan and I couldn’t get enough! 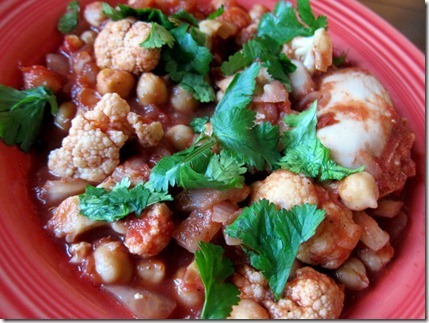 Have you tried using dries beans in crock pot dishes? If you soak them over night they’ll cook through in 6-8 hours no problem. Plus thy absorb the flavors of the dish and save you at least at least $1/can of beans. love this tip! thanks, colleen! Mmmm it looks like a spicy, middle-eastern meal! I like how this is a bit different then the usual stew or meat bucket kind of meal normally made in a crocket pot, it really changes it up a bit! Great recipe! yeah… india isn’t a part of the middle east. Whoops. Your completely right. Looks like I need to brush up on my Geography. Embarassing…. It was about a pound of chicken. I would say you could easily substitute chicken breast. Just put them into the crockpot raw and shred them before serving once they’re cooked. Looks delicious! Can’t wait to try! I, too, have seen garam masala everywhere but haven’t tried it yet. I’ve never used garam masala either. I’m getting the ingredients to cook this up this week. Have a great day! chickpeas go well with anything 🙂 that sounds good! chickpeas go well with anything 😀 that sounds good! Yum! I would have thought chickpeas would turn to mush that long in a crockpot good to see they don’t! Wow this looks great!! I’ve never tried garam masala, but I think I’m going to have to give this a try this week! I usually just throw chickpeas on a salad, but after have a side at Bonefish that was chickpeas, turkey sausage, spinach, and tomatoes, I’ve been wanting to experiment more with them! thanks! I love garam masala!! I was soo hoping you would share this recipe! Definitely going to be my crock pot meal for this week! yay!! so glad it turned out. already bookmarked the recipe and think i’ll make it this week. i LOVE this challenge! thanks 🙂 i hope it was tasty. I love garam masala, so i’m sure ill like it 🙂 THANKS JULIE! I’m glad your crock pot your crock pot challenge is off to a good start! Thank you for this!! I’m a terrible, terrible cook, but my mom loves new recipe’s, I’ll be showing her! Yummm! I’ve made something really similar to this before and served it over rice. Love Cooking Light!!! I LOVE indian flavors and garam masala! Going to try this one for one of my wednesday night dinner responsibilities soon! My fam loves indian too! Glad it turned out great. Was it spicy? Do you think kids would like it? This looks so delicious! Adding Greek yogurt on top makes it look 100x better! 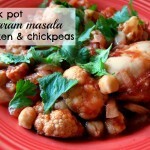 I always have to add some freshness to crockpot recipes after they’ve been cooking all day. I’m so going to give this a shot! I just gotta go grab some of that spice and chickpeas! Looks delicious! Never cooked with garam masala but I have had it before and love the taste of it! 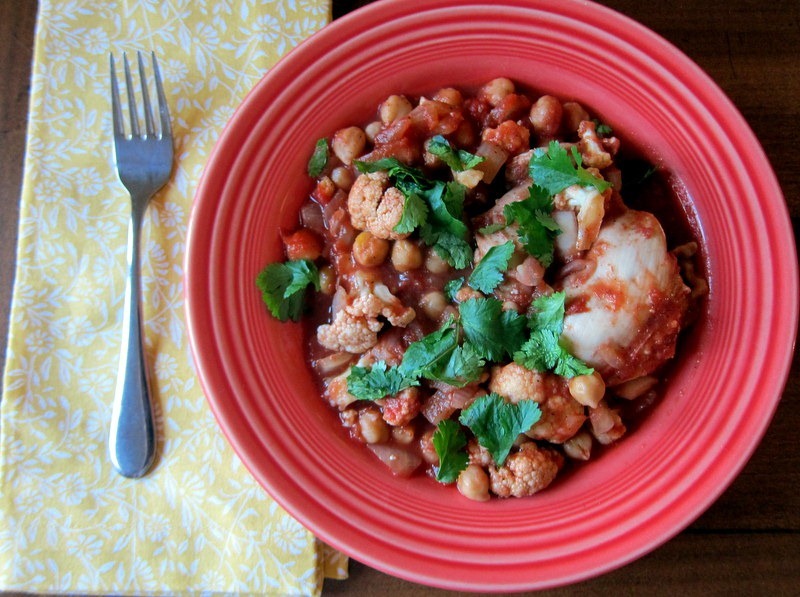 I also am obsessed with chickpeas so this recipe looks like a winner. Perfect combo! Chickpeas are one of my favourite crockpot additions!!! i’ve never used garam masala either – i’ll have to find some! I love anything with cilantro – so I will totally be making this at some point!!! 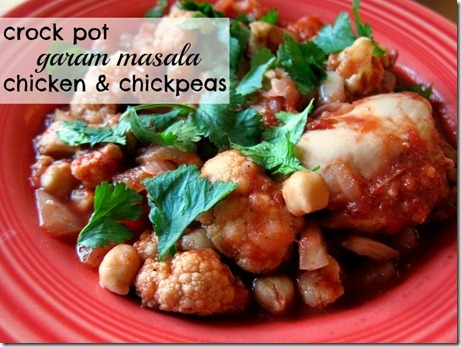 I love garam masala and just made a similar dish in my dutch oven last week using lentils and chickpeas. I’ll have to try this recipe soon! We have a cookbook called ‘Fix It and Forget It’ that has amazing Crock Pot recipes! I am sure you come up with a lot of your recipes on your own, but in case you are in need of some new ones, I would totally recommend it! So glad you shared the recipe. I have all the ingredients except for the garam masala! I will definitely try this soon, but I’ll use chicken breasts instead of thighs. This sounds super yummy and easy. I love Indian-inspired food and cannot seem to get enough of it right now. I would love to try this without the chicken! What a great recipe! Love dishes like this one! Looks wonderful but how do you think it would be without chickpeas? I’m allergic. Sub another bean or leave out? I am going to need to add that recipe to the list. Yum! Hey! I’ve just discovered your blog all the way from Belfast, Northern Ireland! I absolutely love it, and since over Christmas I’ve fallen off the exercise and healthy eating wagon I am finding it so helpful! Thank you so much! I’ve never even heard of that spice, i’m going to have to try it out! I love chicken masala!! And I’ll love it even more now that I have a crockpot recipe for it I’m sure 😉 THANK YOU! The lazy chef in me is so happy right now. I’ve never tried garam masala either. In fact, I’d barely heard of it until now! Hi Julie — I am new to your blog and I am already addicted — I check every morning for a new post! I especially love the circuit and interval workouts and the restaurant reviews — even though I live in Canada, have only been to Florida once and will probably never actually eat in these great restaurants you visit! I read with interest the comments in response to your question about what makes a good fitness instructor (I was flipping through some old postings) and learned a lot from them. But I also liked what you said in another posting — the 7 links one — about trying to ignore catty or critical-without-being-constructive comments. As a volunteer fitness instructor at the YMCA I cringe when people post nasty feedback about other volunteer instructors and classes (and the fitness coordinator says they can’t even post half of them, they are so outrageous). Once I heard two women being sort of nasty about my class in the change room (they could not see me). All I know is that I do my best EVERY time I am asked to teach a class – I plan it out carefully, I think of themes, I offer modifications, and I try to incorporate lively, up to date music. Still, when you put yourself out there, it is hurtful to hear snide comments, even if they are outnumbered by good ones. I am surprised that anyone would be so rude as to criticize your appearance or insult your blog — but then again, as you say, some people are just miserable, and misery loves company! thanks so much for taking the time to leave this comment, rebekah. you sound like a very thoughtful instructor – i wish i could take one of your classes! Yum it looks good- minus the coriander. For me, coriander can easily ruin a dish. I hate the taste. I once heard that it tastes feral to some (like me) and better to others.